Hello there, friends! I’ve missed chatting with you – it’s been a busy month stamping and sharing and being a wife, friend and mother! I’m happy to be back at the keyboard. Almost a month ago I shared my first version of an Advent Calendar made with the 25 and Counting stamp set in the Holiday Mini catalog. I was inspired at convention back in July when I saw the version the creative team at Stampin’ Up! made, and Cheryl and I spent a couple of hours on the plane home trying to figure out all the products that were used and how much it would cost to re-create the project. The answer, to be precise, is 1) a lot and 2) a lot!! Still, I was committed to the project and put together my version of the calendar. I even offered it as a class and the brave women who came assured me that they loved it, even though we spent over 5 hours and didn’t quite finish! Talk about the class that never ends! It was a lot of work, but I confess I’m really happy with the end result. Do you like it? These are the boxes from the Bitty Boxes and Envelopes Bigz die, and they were the perfect size for the little date cards I designed. The challenge was that when you put 5 boxes in a row, they added up to 12 1/2 inches wide. AARGH!! I couldn’t find ANYTHING ready-made that would accomodate them, and I didn’t want to pay for a custom frame. I was rummaging around my local craft store and stumbled upon canvas stretcher bars. They’re not designed to be frames, but in a pinch – well, they were the perfect solution! I used four 16 inch bars and it gave me just the right dimension. A piece of poster board attached to the back with Sticky Strip gave me a place to put my velcro dots. At the moment, the boxes are a little catty-wompus since we were taking them out and playing with them at a couple of recent classes. They’re plenty large enough for a treat or a message. It was a lot of work, but well worth the effort. 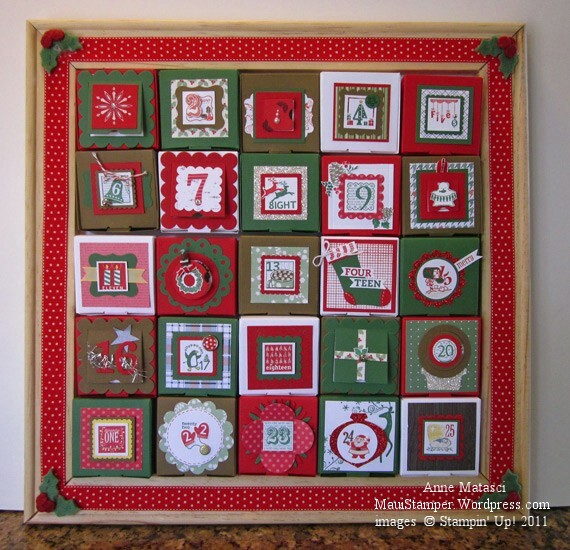 gorgeous advent calendar. i felt like i needed to leave some blog “love” after all the work you put into this project. thanks for the hard work and time you put into this and for sharing it with all of us. happy thanksgiving!